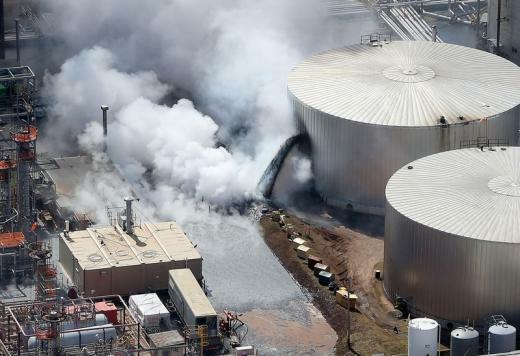 On Thursday, the U.S. Chemical Safety Board said the April 26 explosion at Husky Energy’s Superior, Wisconsin, refinery was probably triggered by air leaking around a slide valve into the gasoline-producing unit that blew up. At a news conference, board investigators said iron sulfide, a substance within the carbon steel inside the gasoline-producing fluidic catalytic cracking unit (FCCU) was probably ignited by the air leaking in the unit, setting off an explosion of volatile hydrocarbons. “The mixture of hydrocarbons and air within the FCC unit likely caused the explosion,” said CSB Interim Executive Kristen Kulinowski during the news conference in Superior that was carried on a conference call. Husky said the company continues to work with the board on finding the root causes of the explosion. “The lessons learned will assist with our decisions as we begin the process of rebuilding the Superior refinery,” said Husky spokesman Mel Duvall. Despite the refinery’s shutdown, the company does not plan to lay off employees, Duvall said. The FCCU explosion led to a release of flaming asphalt across the refinery and raised the risk of explosions that could release deadly hydrofluoric acid into Superior. Because of that risk, thousands of Superior residents were forced to evacuate for up to 24 hours. Kulinowski said no hydrofluoric acid was released by the explosion. Thirty-six people sought medical treatment after the blast, including 11 people working at the refinery, according to the board. Duvall said the refinery would likely remain shut for 18 to 24 months of repairs. Kulinowski said the slide valve may have been eroded by years of contact with the fine powder catalyst, which has the consistency of sand, needed to breakdown gas oil into gasoline. The unit was being shut for a planned overhaul at the time of the blast. The FCCU’s slide valves also prevent air from mixing with volatile hydrocarbons. Air leaking past the slide valve “is the most probable cause for the explosion we have today,” said CSB lead investigator Mark Wingard. Kulinowski said the board hopes to complete its investigation of the Husky explosion within 18 months to two years. The CSB’s final report will include review of the maintenance of the FCCU. The U.S. Chemical Safety Board investigates fires at the nation’s chemical plants and recommends improvements in operations and regulations. It has no regulatory or enforcement authority.